What’s Really Making It Tough For Australians ? However the reality is that it’s their tax policies which have most affected the disposable incomes of Australians. If Australia wants to improve the well being of Australian citizens then we should be adopting realistic, evidence based, pragmatic solutions, even if they are ideologically different to what the Liberals ‘feel’. Some estimates suggest that around one third of Australians are living under mortgage stress and a growing number are under ‘extreme’ mortgage stress. The ABC reports a growing number of people dipping in to their savings to pay bills. Around 1 in 6 families struggles to pay what they owe on time. The Liberals have been raising the issue of energy prices and the impact they have on normal Australians. 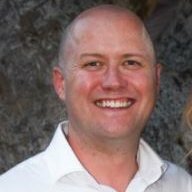 The debate around Energy prices was part of the reason Malcolm Turnbull was ousted as PM recently. So What’s really causing Australian families to struggle? It’s the tax system which is behind Australians’ struggle. The government is blaming energy companies, among other things, but it’s actually them putting the boot in to Australian families through Fiscal Drag. Fiscal Drag, also known as Bracket Creep is an increase in the real tax levels people pay, caused by a failure to raise tiered allowances, as inflation lifts wages, in progressive tax schemes.You already understand the concept of bracket creep intuitively. Inflation increases at 3% per year, too. You’d be about as well off at the end of the year, as the start, right? Sooner or later, those 3% increases tip you in to a higher marginal tax bracket and pay more tax as a proportion of your income. Your take home goes down and the government gets a bigger share. Imagine you were earning $36000 and there was a 3% inflation rate. Your wages go up by the same amount. After a year or two, you’d move to the higher tax rate and pay a higher proportion of your real (after inflation) income in tax. Source : Wikipedia. There is actually a very easy metric to use when you want, to determine the real amount of tax you / we pay, on average, across the economy. The CIS, Center for Independent Studies produce it every year. It’s called Tax Freedom Day and it’s the date on the calendar, by which you cover the annual tax burden. In 2018, the date was April 16th. It’s a useful measure because, by anchoring the tax burden as a time period, the complexities of ‘inflation’ adjustments and all the other thing which could be used to muddy the waters are removed. Over the next 5 years, the Center for Independent Studies says the tax burden paid by individuals will increase another 12%! ‘Much of it is due to bracket creep’ points out the CIS. 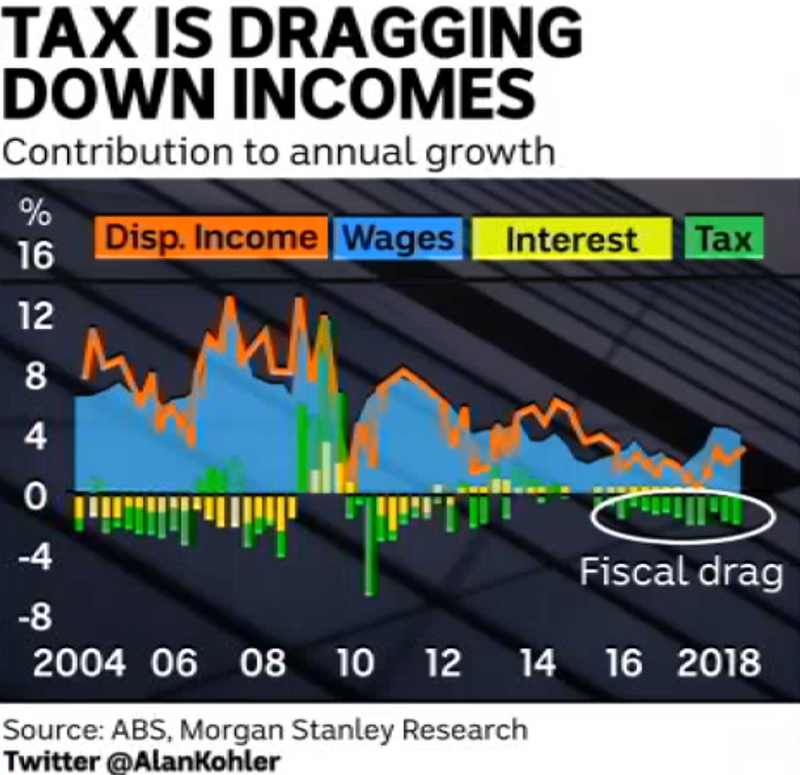 Kohler’s chart also shows that it’s this phenomenon – bracket creep – which has actually curtailed real income growth in Australia. Basically, the amount the government is taxing normal people, when they are already ‘stressed’ is what is making the bills hard to pay. So, real wages are stagnant, and the prime minister isn’t disingenuously distracting people by talking about fixing an energy problem his party’s inaction caused. The reality is that he and his party (specifically their income tax rules) are the most substantial component of the cause of low and declining net incomes. It’s a crazy situation made worse by the fact that the reality is not being discussed in the public eye, and the concepts involved are not commonly understood. It’s a spaghetti of misunderstanding about which politicians deliberately obfuscate, accentuating inequity and precluding solutions. Just to be clear, for net incomes to remain the same, people will have to receive a 12.6% wage increase over the next 5 years. Or the government will have to change it’s tax system and raise it’s tax thresholds in line with inflation.